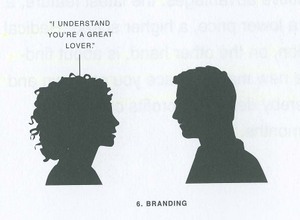 For the graphically-inclined, Marty Neumeier illustrates the differences between Marketing, Advertising, PR, and Branding on pages 24 and 25 of ZAG. 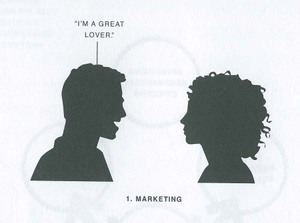 This is the best, most simplistic definition, visual or verbal, of core marketing disciplines that I’ve ever seen. Note ... you can also find this illustration deep inside the flash-heavy ZAG website. Honestly, and I want to be completely transparent here, I have the passion to be a really great lover. 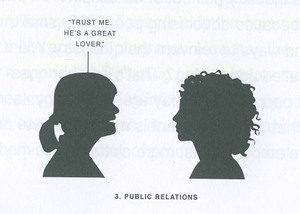 The Word of Mouth approach is even trustworthier than PR: "Oh yes, he indeed is a great lover"
Interesting. 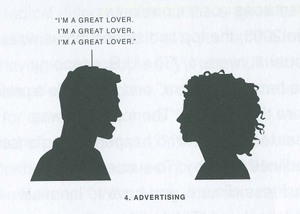 I wonder though if we should differentiate marketing and advertising a little more, so here's an alt for the marketing panel "Statistically, we believe you're in need of a great lover." Tabloid version: "He was a such a great lover, that Paris Hilton told Lindsay Lohan, that Angelina Jolie is starving herself trying to win him back in case Brad reunites with Jen."